I'm partial to a little necktie refashioning, particularly when there are so many unwanted ties found in charity shops and thrift stores around the world. I have a pinterest board dedicated to things made with mens neckties, that I add to for future ideas. 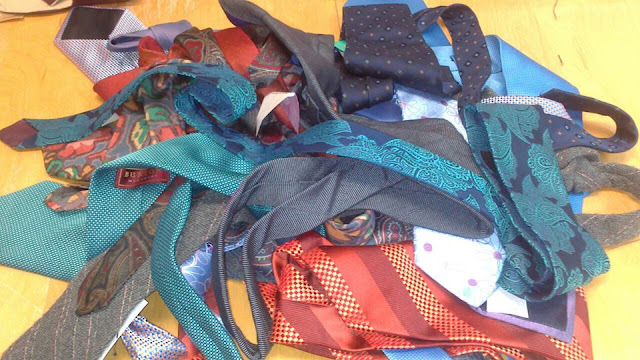 With Father's Day coming up this weekend in some parts of the world, I'm sure there will be plenty of neckties given to Dad's, which at some point may well end up being donated to charity shops too. There is an interesting article on ecotourre 5 Ways to Recycle an Old Necktie Into a Last-Minute Father’s Day Gift, providing ideas for crafty folk to make something for Dad using existing neckties rather than buying new. 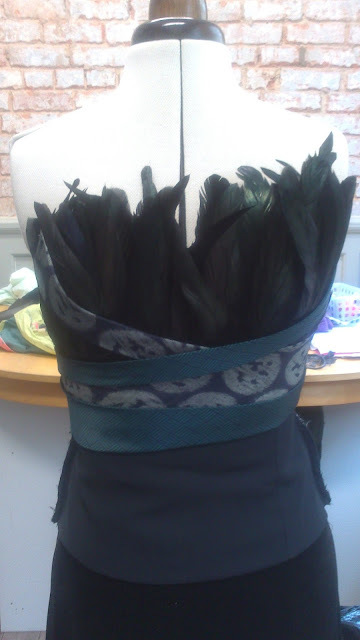 Putting Father's Day aside, Eleanor Bland under her registered recycled clothing line Re-fashioned LTD has been busy with her pre-loved necktie dresses. You may remember some of her previous necktie creations seen here. This dress was made as a commission for someone to wear on her honeymoon, and another made for a photoshoot in a few months. The bottom part of her dresses are made using a mixture of pre-loved garments such as old velvet skirts, as well as factory seconds and leather scraps. 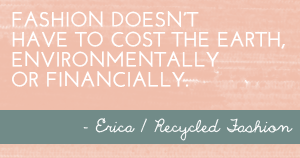 "I try to use end of line or vintage fabric where I can to make it even more eco friendly by hopefully stopping things ending up as landfill somewhere or gathering dust in a charity shop. I also use factory seconds from a market stall in Leicester, some of which are really unique and quirky." Eleanor Brand, Re-fashioned LTD. 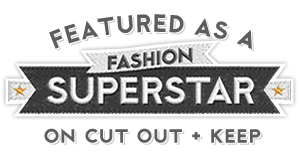 Her designs are now for sale through Re-fashioned LTD's etsy store, made as custom orders. 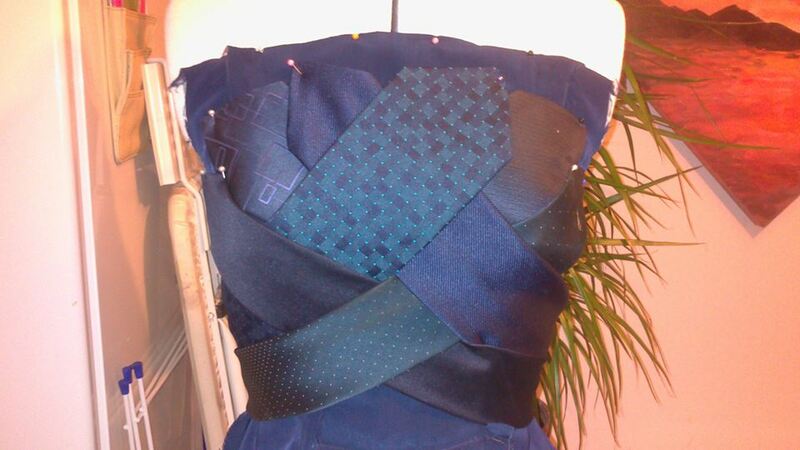 Buyers choose any colour for their final dress design, chosen via photographs of Eleanor's tie collection. The beauty of using neckties in upcyled fashion projects, is not only the colour and pattern variation one can find in thrift shops, but also the quality of material; silk ties are easy to come by. I am a huge necktie hoarder. The more vintage....the better. Eleanor has a great talent in turning thrifted neckties into unique creative fashion. gorgeous dress! Eleanor is so creative.